I am the proud Principal of MacLeod Public School. We are a K-8 school with a population of 596 students. 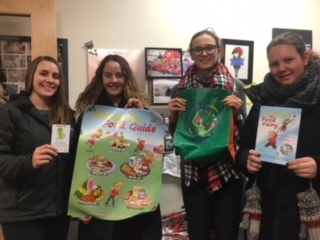 We are so excited about showcasing the great things our school already does with regards to healthy eating and how we take part in many community initiatives that promote a healthy lifestyle. 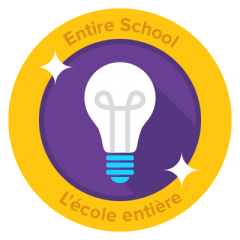 We are also interested in learning new ideas to promote to our students and parents as well. Today we had our Staff Christmas Luncheon and had a salad bar available with our yummy Lasagna from our friends at the Caruso Club!!!! It was so delicious we forgot to take a picture!!! FILLING STOCKINGS FOR THE HOLIDAYS!! Students were invited to fill their lunch bags with apples to bring home for the winter break so they would not go to waste at school!!!! Instead of purchasing teacher gifts, we encouraged our parents to pay it forward and instead purchase Sudbury Food Bank cards for $5 each. 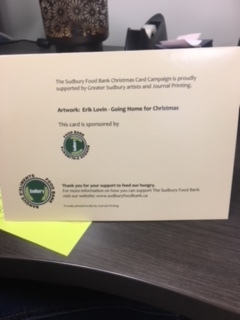 Through the purchase of this card from the Sudbury Food Bank a Christmas meal has been provided for a hungry person living in our community. Once our Elf on the Shelf, Marigold, heads back to the North Pole, Stargold will take over in January. Based on the children’s book, Stargold the Food Fairy, each class will go on the exciting adventure by reading the book and we will make our own food fairy that will float around the school with messages of healthy eating! Our Heroes are the Sudbury Health Unit Dietitians who gave us this wonderful book to help spread the message!!!! For our Christmas Concert, the Grade 6’s created ‘regift’ baskets and sold tickets at the concert to raise funds for the Sudbury Food Bank to help feed our community! 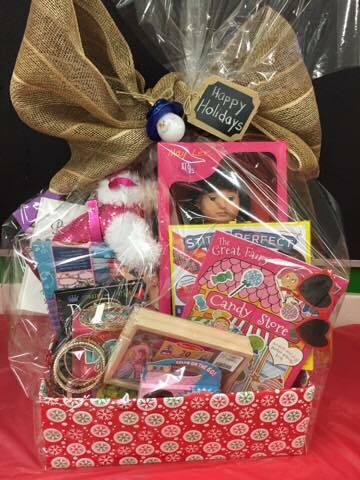 We had 7 large baskets to raffle off! 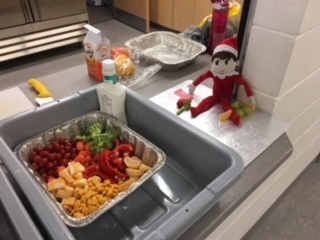 We hosted a Christmas Dance today and had a veggie and fruit tray out for the kids instead of our usual treats of chips or popcorn! Small changes keep happening at MacLeod!! APPLE CRISP AROMA IS IN THE AIR!!!!!!!!! 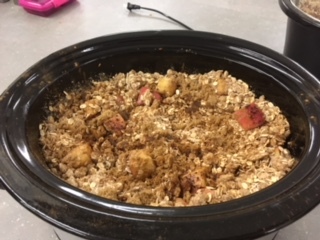 Classes participated in a apple crisp extravaganza where they made apple crisp for their whole division!!!!! To keep it a healthy option, very little sugar was used and the classes discussed how simple it is to cut down on sugars and still come out with a very tasty dessert!!! 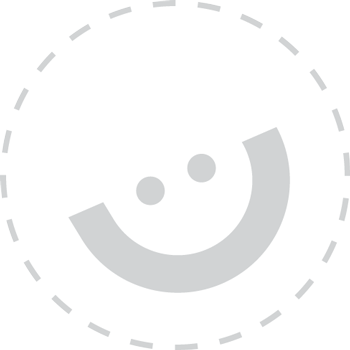 FRUBAR JUICERY Joining in on the FUN! 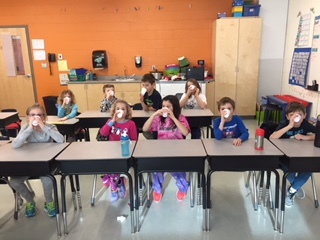 Frubar Juicery brought in a class set of smoothies for the Grade 3’s! These smoothies were packed with yummy goodness!!!! 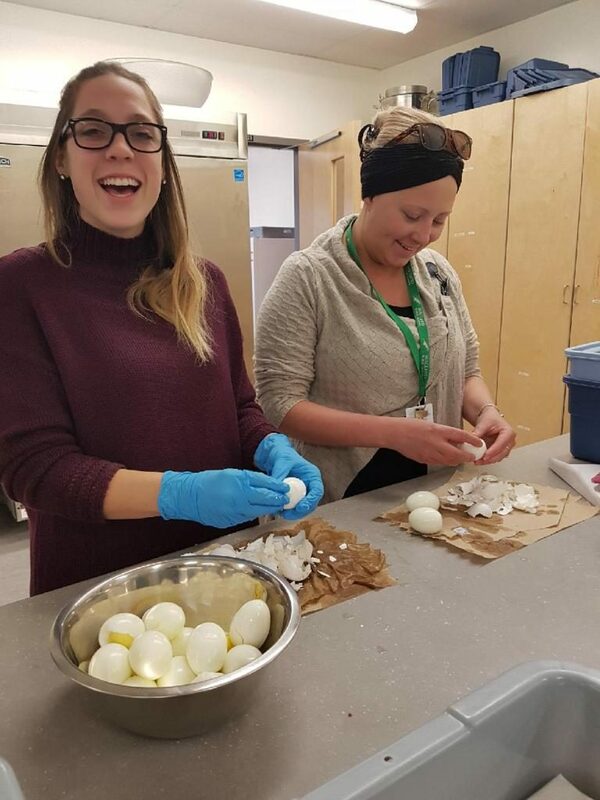 We have been serving hard boiled eggs weekly in our snack program. They offer that protein that we find is the easiest food group to sometimes skip!!!! 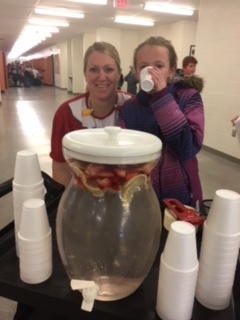 To keep all of our dancers hydrated, we had a fruity water station set up in the Gym. The Grade 7’s offered to make some yummy oatmeal to warm up the students on this chilly morning! Oatmeal with fresh fruit is a great way to start the day!!! 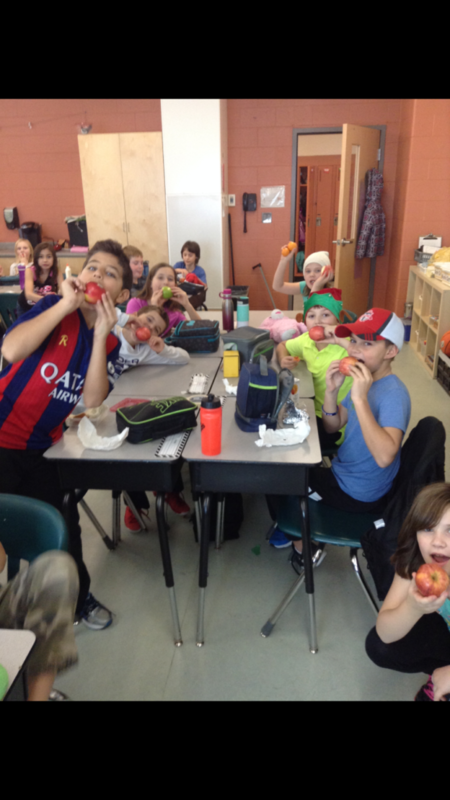 The Grade 3’s chose to have apple slices as their reading log party treat!!!!! What a great idea Grade 3’s!!!!! The heroes are our students who decided to have a healthy treat to celebrate their reading accomplishments!!! 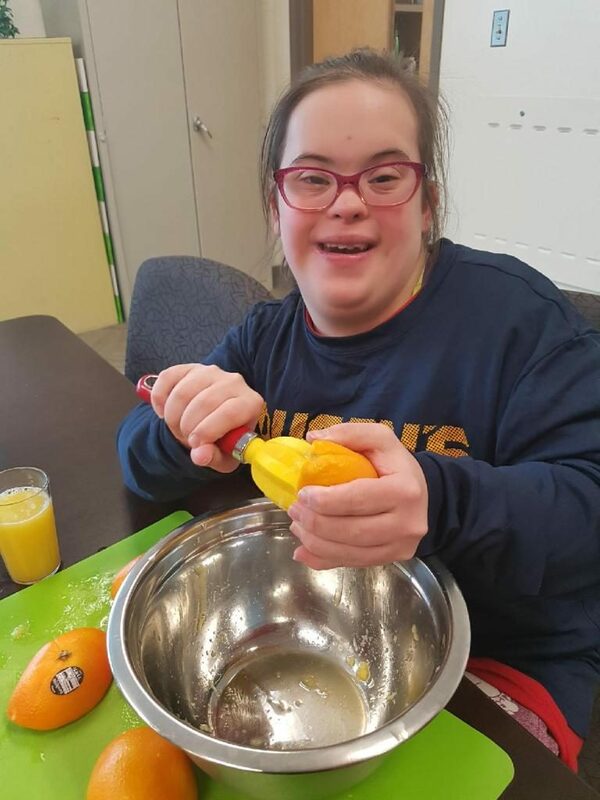 Our friend made freshly squeezed orange juice for her friends to start their morning off!!! Our Mustangs collected 72,314 food items for the Edgar Burton Kids Helping Kids Food Drive!!!!! This food will go a long way to feed the people in our community! Our goal was to get one more can than last year, which would have been 38, 729, but the students here went above and beyond and crushed their goal!!!!!!!!!!! So proud of all of our Mustang Families!!!!!!!!!!!!! REALIZING THE IMPORTANCE OF EXERCISE – The Data IS IN!!! 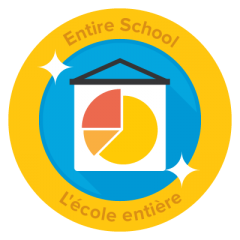 The Grade 4/5’s have used their data to come to the conclusion that they could be doing more physical fitness in their daily lives and have added that aspect to their class on a daily basis. They will do this survey again in 3 months to see if they have made a difference in their lifestyle!! 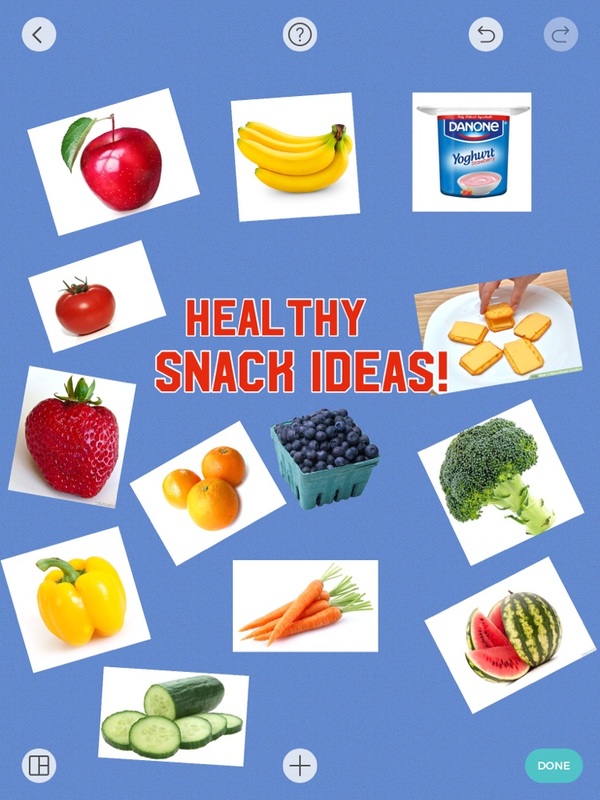 The Grade 2/3’s used the Pic Collage App to create healthy snack posters to put around the school and have sent them to the teacher’s email to share on their smartboards. 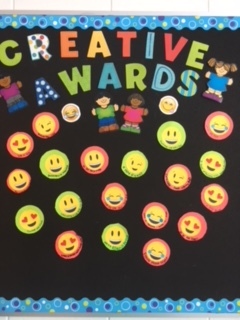 They came up with great ideas and it was evidence that our work with Bright Bites is educating our students to make healthy choices!!!! 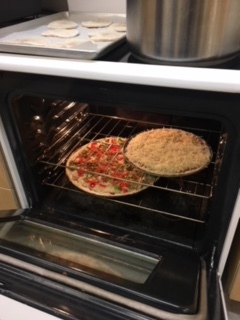 Our ISP class made homemade veggie pizza and a cheese pizza for their friends!!!!!!!!!! They had a great great time shopping for their fresh produce and making their creations! IT WAS DELICIOUS! Healthy pots of soup filled with fresh vegetables is a sure way to boost our immune systems and have us ready to battle the cold weather ahead!! 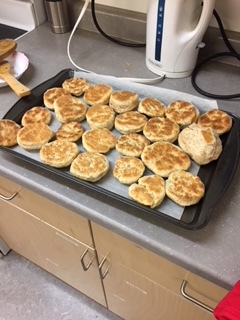 A Dietitian visited our kitchen and showed the students how to make super healthy, homemade biscuits which then they fed to all the staff!!! Thanks so much girls!!!!! 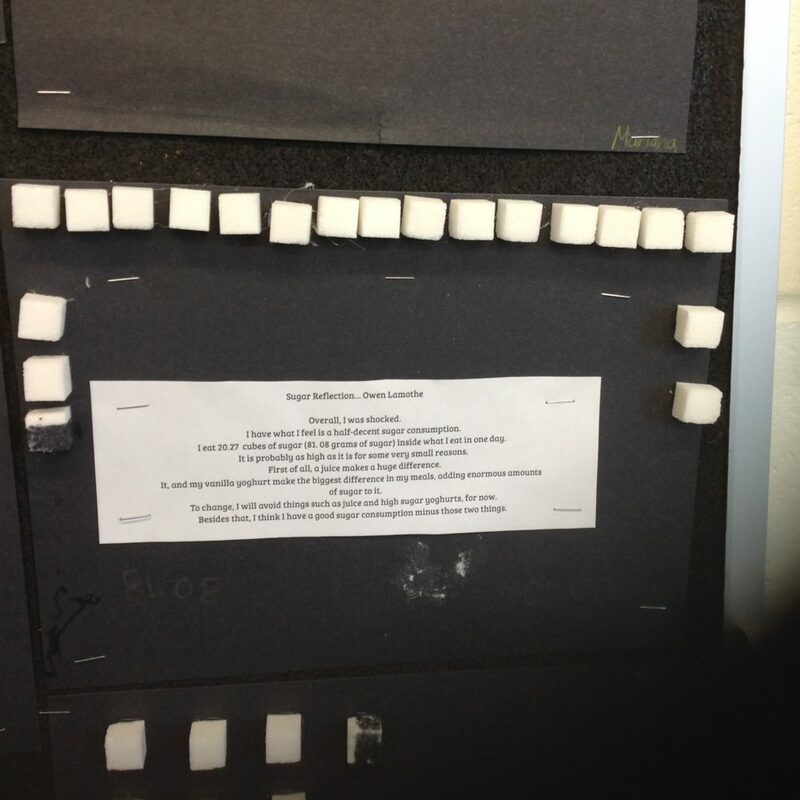 The grade 8’s did a sugar inventory to see where they stood with regards to sugar intake in their daily food intake. What a surprise to find that our intake far exceeded the daily limit of 2 -3 cubes. This was then shared with the school so we all realize how much sugar we are putting into our diets and what foods to eliminate or decrease to balance our levels! Great job of educating us all Grade 8’s!!!!!! Our ISP class spent a few weeks learning all about the importance of shopping the perimeter of the grocery store to ensure you are filling your cart with fresh, healthy food!! 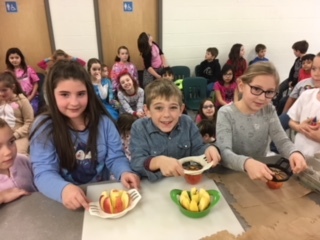 The Grade 2’s were taking their new knowledge from their healthy eating unit and putting different food into the food groups. 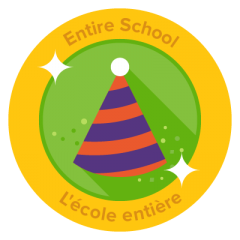 a balanced diet was discussed in class, so they even made room for a treat now and then and had a special category for special events!! 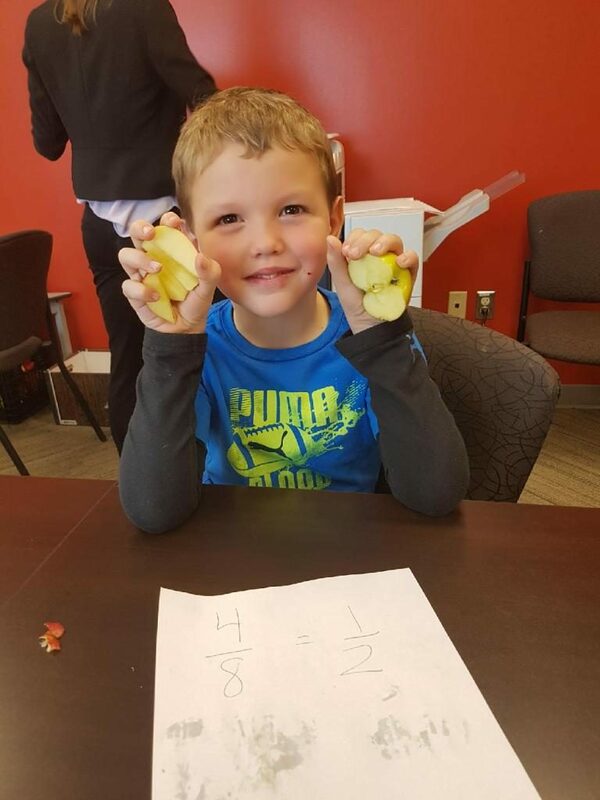 Bringing fruit to life in the math world. What a great way to teach fractions to our students so it makes sense in a practical way. The apple easily represents a whole when picked, and once sliced, becomes a visual for halves, quarters, eighths, etc… Great job!!!! And we are told the best part was that they can EAT their work when finished!!!!!!!!!!!! HEALTHY SNACKS FOR OUR YOUNGEST LEARNERS!!!! Every morning, we make snack trays for our Kindergarten friends so they can fuel their brains and be ready for the day! 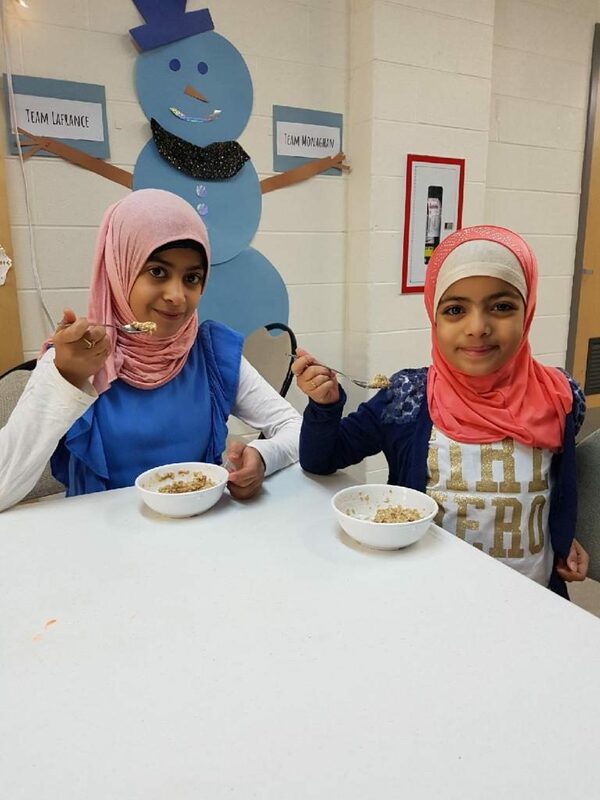 We find the importance of this is two-fold; they are excited to eat healthy snacks and this allows them a chance to share and eat with friends! Our heroes are our EA’s who make these trays every morning!!!!! At MacLeod, we are so fortunate to have many different cultures within our building and we use this as an opportunity to learn from each other. 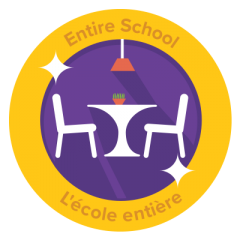 When having school events, we always ensure that we are meeting the needs of all of our students and their families and ensure we are providing healthy meals that meet everyone’s dietary requirements. When we share meals with each other, it allows us to learn more about each other and learn even more about cultures! PASTA DAY JUST GOT BRIGHTER!!!! We are now adding an extra healthy snack to our Pasta Days. Along with the warm pasta, students will also have the opportunity to snack on some fruit, veggies and cheese. Every week, a new creation is sent to one of our 3 floors for all to share!!! SNOW DAY FUN WITH VEGGIES!!! 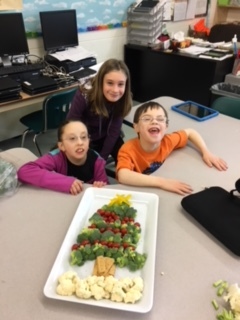 We had a snow day yesterday and gave one class an opportunity to make a festive creation for their class with vegetables! Their veggie Christmas tree was beautiful and a great idea for all to make over the holidays!!! MARIGOLD THE ELF IS EVEN IN ON THE ACTION!!!! 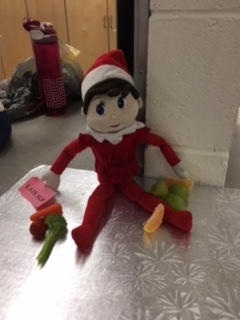 Our very own Elf on the Shelf, Marigold, is bringing veggie and fruit messages to each class as she visits a new class each day! Today we caught her spying on the kids as they made their way to classes!!! 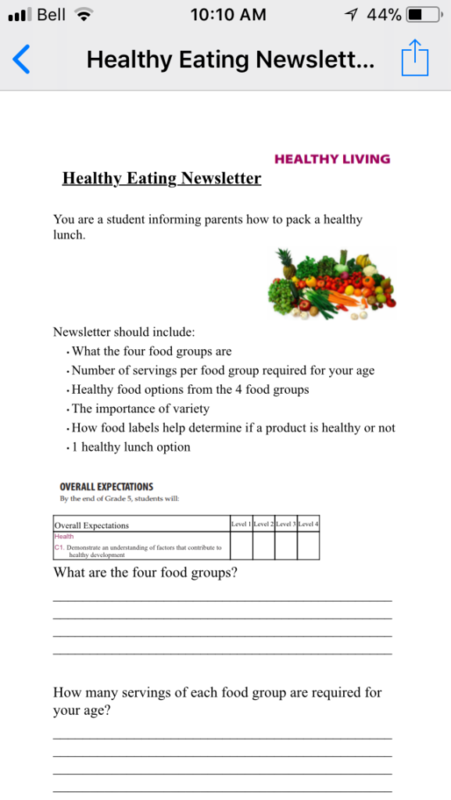 The Grade 5/6 have created a Healthy Eating Newsletter for the school to make families aware of the importance of healthy eating and to also share ideas for nutritious lunches. 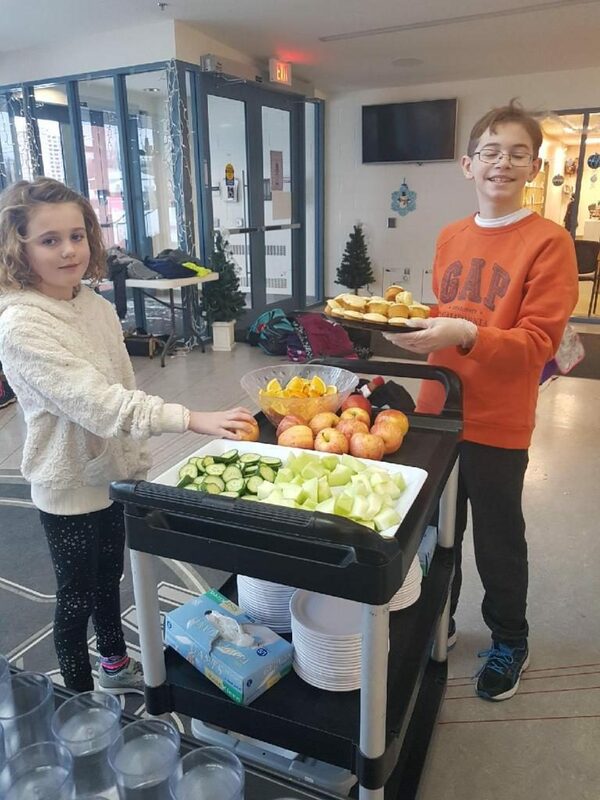 The students are giving creative ideas of some of their favourite snack ideas for lunches, and as parents here at MacLeod, we sure are appreciative and thank them for their efforts and ideas! They are heroes for spreading the word and offering easy suggestions for lunch ideas!!!! 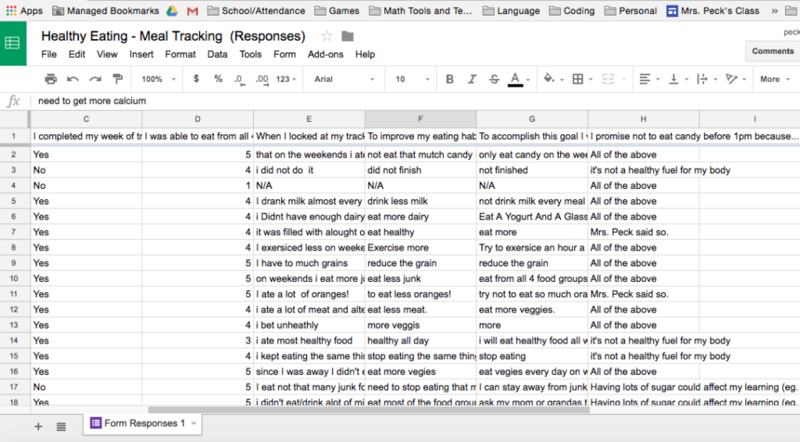 The Grade 4/5’s tracked our eating for a week. 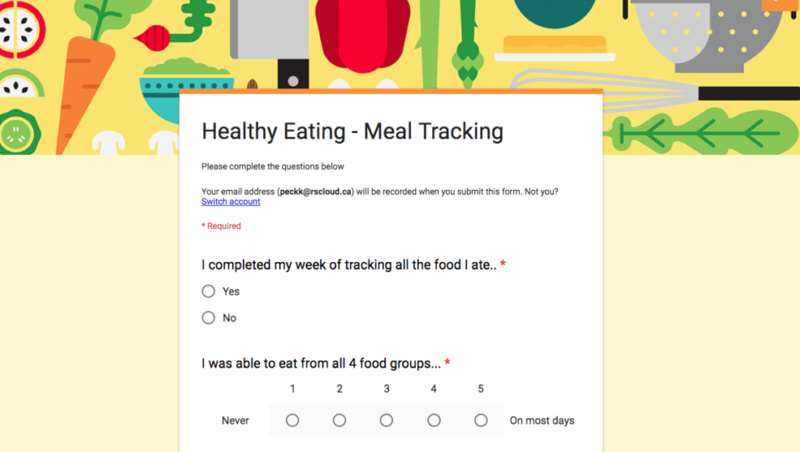 We then completed an online survey via Google Classroom so that we could analyze how we could improve our eating habits. This allowed students to share ideas with their classmates about possible snacks and meals they could try as a family or in their lunch! serving, learning about, and eating healthy local foods at our school. VEGGIES in our BOOSTER JUICE???? What a great way to introduce a variety of vegetables into our smoothies. The kids were so surprised that these smoothies contained Kale, Beets, Cucumbers and fruit!!! 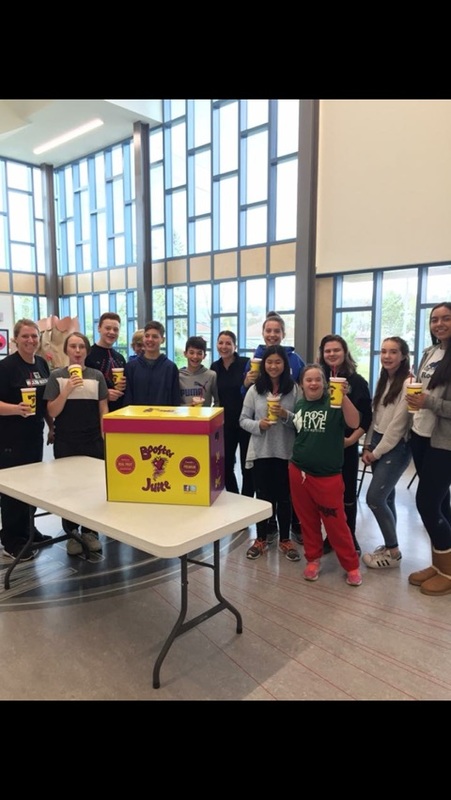 Thank you to Booster Juice for the donation!!!!!!! 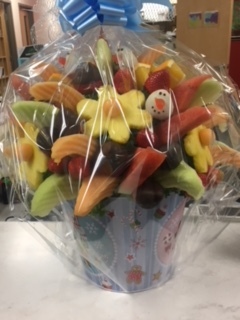 We had a fruit basket delivered to the school yesterday to celebrate all of the hard work from the students and staff in Grade 8!!! What a great message to the students to reinforce our Bright Bites work!!! For every whole food item brought in lunches receives 1 “i’m impressed’ ballot that will go into a bin to win a MacLeod re-useable water bottle! Heroes in this case are the Grade 5’s who thought of this great idea!!!! 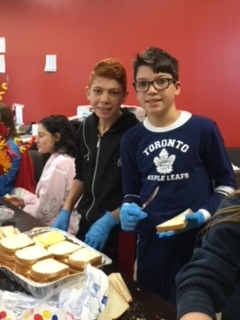 We are all beginning to understand that it is small changes in everyday practice that will lead to lasting changes in our health, so we decided to change up Grill Cheese Day a little and we used REAL Cheddar cheese instead of processed cheese slices!! Small changes make a BIG DIFFERENCE and taste yummier!!!!! Special thanks to our Grade 7&8’s for taking the lead on this!! 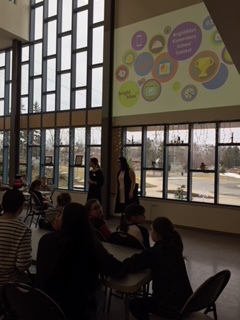 We reached out to the Sudbury Health Unit to help us come up with more small changes to make a lasting change in the school and we were joined by Chantal and Melanie who brainstormed with our student parliament all of the many things they could do in the school to make positive changes to our health and nutrition practices. Our heroes were Melanie and Chantal!!!! They rejuvenated our spirits and we are full of new ideas!!!! 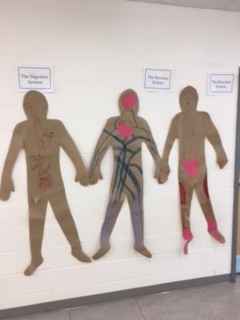 Students were learning all about all the major systems of the body and how they are all inter connected!!! Focussing on a nutritious packed menu for all 3 meals helps to take care of all of these systems for LIFE LONG benefits!!!!!! 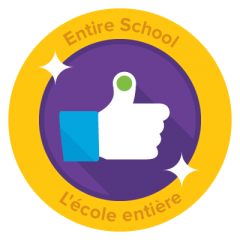 Way to go Grade 4’s!!!!!!!!!!!!!!!! All of our students took part in Rainbow Day, were streets were canvassed in the community to collect food any money for The Sudbury Food Bank. 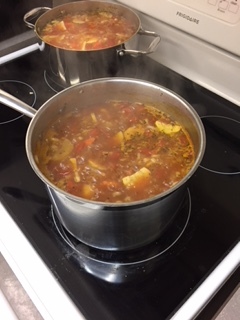 We have been talking as a school about the importance of a healthy, balanced diet and this was our way to raise money and food to help all members of our community to have access to a selection of healthy, nutritious food over the next few months by stocking the shelves of the Food Bank. The money will be used to buy perishable items such as meat, milk, fruits and veggies. 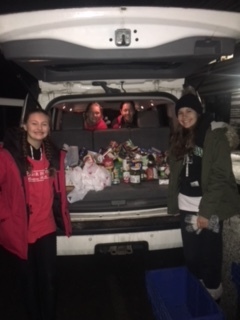 The heroes are our amazing students and their parents who so willingly gave up their evening to help us collect over 13, 000 food items (including monetary donations). 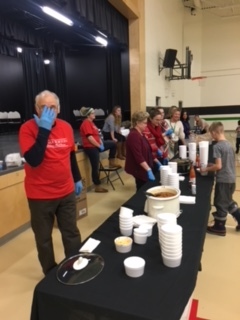 We cooked up chili to feed 300 members of our school and neighbourhood community!!! We served meat chili, as well as vegetarian chili to ensure we met everyone’s likes!!! This was a evening event where all families were encouraged to come on in and share a meal!!! 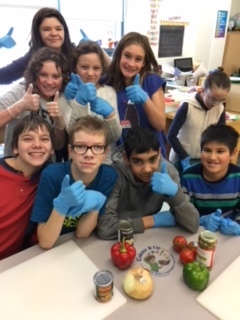 The students helped to chop the veggies during the day for the chili, with our amaziing EA’s…..they are the true heroes in this case!!!!! 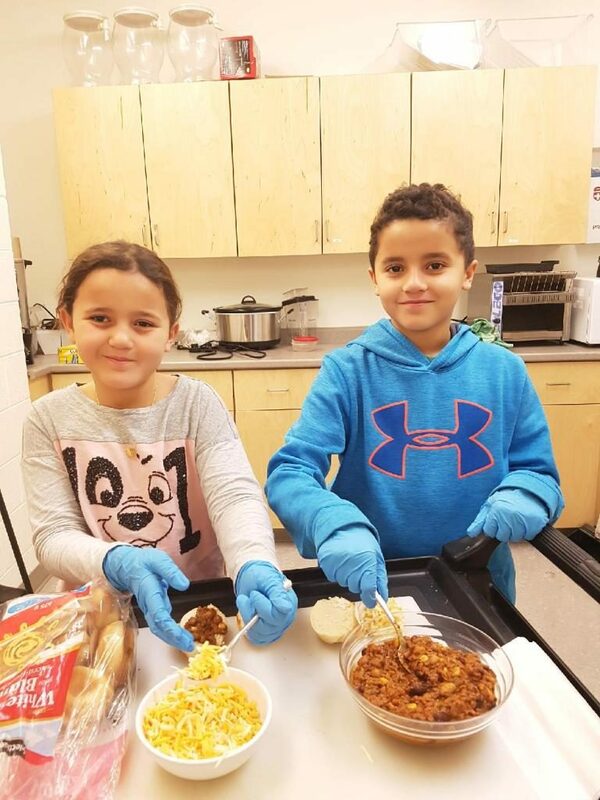 Students created a special, nutritious breakfast for guests at our school last week. 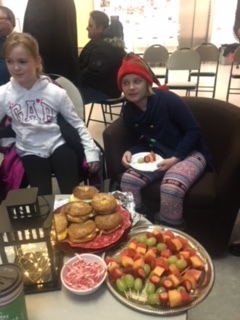 They made fruit kabobs and Bagel and egg sandwiches for members of 92.7 Rock, Mayor Brian Bigger, Sudbury Food Bank Dan Xilon and Members of Local 6500. Their menu for the event was a huge hit!!!!! Way to go Mustangs!!!!! You are doing a fantastic job!!! 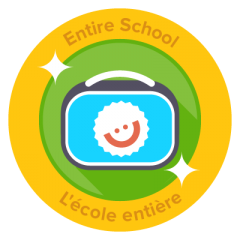 We feel our school has been doing a great job spreading the word about Bright Bites to our entire community of Greater Sudbury. 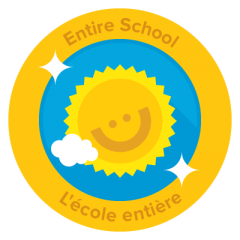 We are reaching not only students and parents on our school but also other schools. We recently were contacted by MCTV News to help with a story they were doing to spread the word to the community! This is a Reason to Celebrate for us, as we are acting as ambassadors on a larger scale and feel we are making a difference. 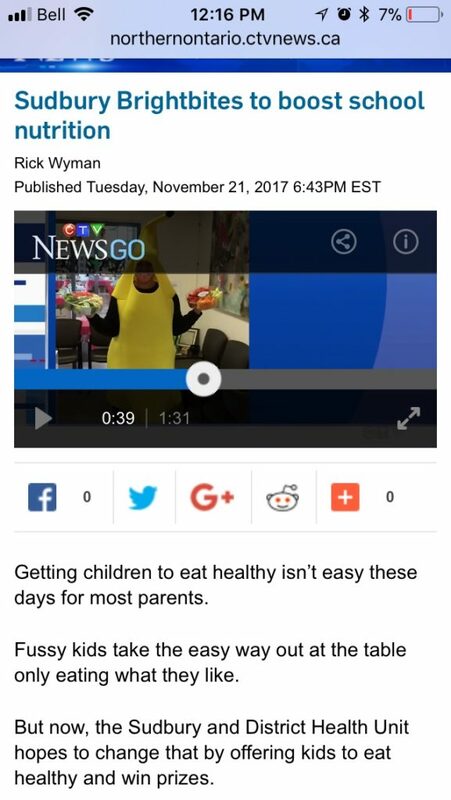 Our Principal made the news in a banana costume——We deserve this badge!!!!! 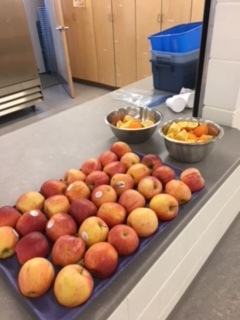 We added a load of greenery to our Breakfast and Snack Program to add to the ambience and calmness of the area to ensure our students are starting the day of right!!!!!!!!! 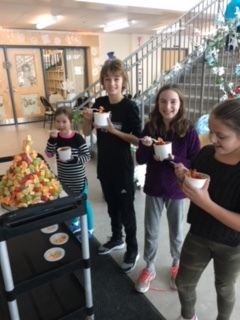 The Grade 8’s decided to create healthy balanced art by showing the school what a balanced meal plan should look like, along with ideas for each food group! 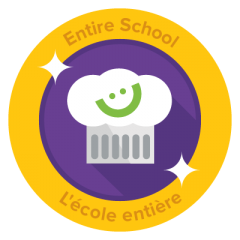 All they used was construction paper, plasticine, glue, markers and their healthy eating knowledge they have learned in class and throughout the school with our Bright Bites education! The heroes in this case were our Grade 8’s and Mrs. Evans for the great idea !! MacLeod is participating in the 2017-2018 Northern Fruit and Vegetable Program. This program is a popular one as it exposes children to a wide variety of fruits and veggies and allows them to share with their classmates!! We had a mystery reader join us the day before Halloween all dressed up in costume and she read to the students. 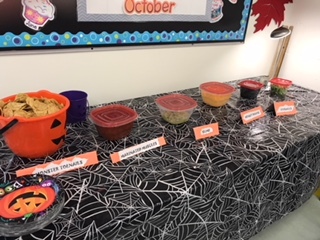 Food was prepared ahead of time to align with the book and healthy snacks such as corn, grapes, tomatoes, avocados and onions were transformed into spooky ‘eyeballs, slime, marinated muscles, monkey brains and monster toenails.’ What a great day!!! 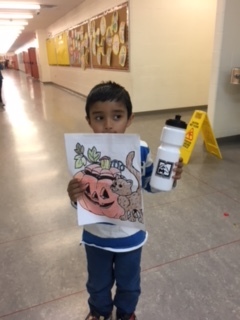 All of our prizes for our Halloween festivities were MacLeod water bottles to promote water consumption. We had prizes for best dance at our school dance, best costume and colouring contest prizes! They were a BIG hit!! 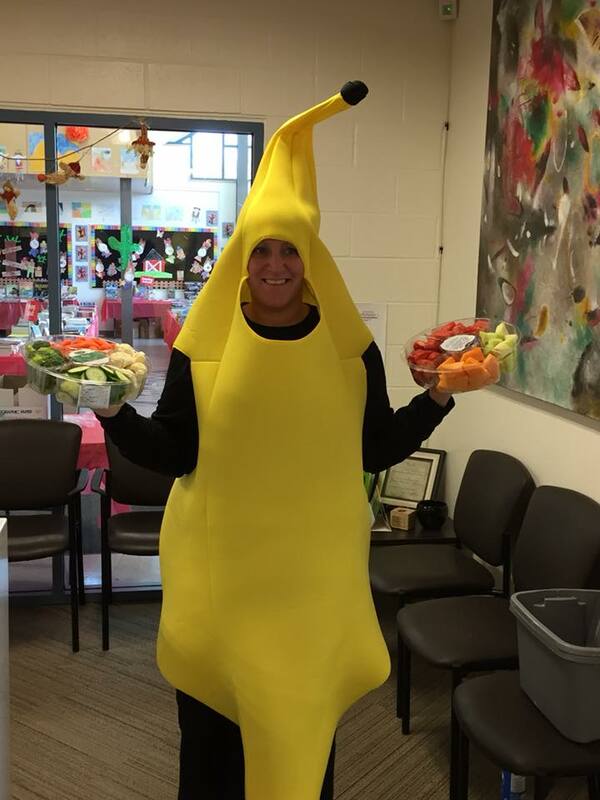 On Halloween, our Principal served fresh veggies and fruit as an alternative to candy! 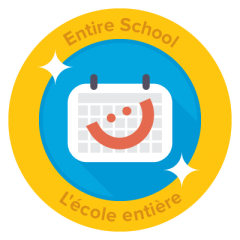 The Grade 5/6’s have another reason to celebrate!!! On their birthday, they get to lead Spark and pick the music they want to move too!!!! Our heroes are the Junior students who thought of this great plan, as an alternative to food. 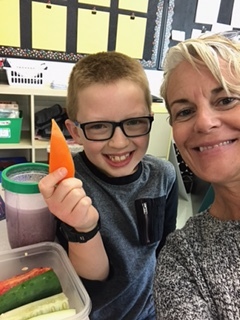 Mrs. Melanson brought in organic veggie snacks to the Grade 4’s to fuel their bodies before they participated in SPARK. They also had a great conversation about Organic versus Non-Organic foods. Our hero today was Mrs. Melanson!!!!!!!!!!!!!!!! Our Student Parliament have challenged the classes to SIP SMART and increase water consumption over sugary drinks! They are educating the classes about the amounts of sugar in certain drinks and sodas. 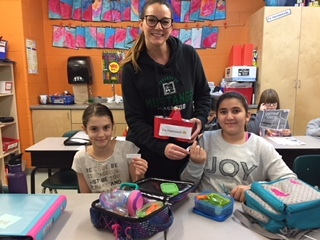 Mrs. Martin’s Grade 5/6 class are educating their families as well and are all bringing in water bottles and canteens to practice what they preach in class each day! 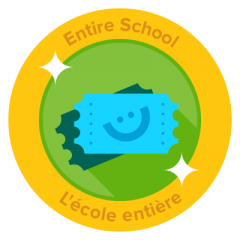 Way to go Grade 5/6’s!!! 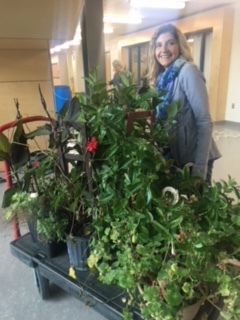 We wanted to continue with the breakfast club makeover and decided to bring in all of our flower pots from our homes this summer to allow them to add to our environment in the school. The natural light in the foyer will help the plants thrive and it was another way to freshen up the room and make it more like home for the kids. We have taken a room which was empty most of the time and turned it into the hub of the school! We took your advice off of your tip sheet and we have added some music to our Breakfast Club each morning. This simple move has added to this wonderful atmosphere and is adding a calming effect to the room, which is allowing everyone to completely enjoy their morning meal and get their minds ready for an amazing and productive day!! She was a walking billboard all day promoting healthy eating and getting students to think about all the wonderful choices out there for fruits and vegetables! Today the students were the heroes as they totally bought in and helped chant the verse in the school and on the playground!! Our ISP is getting breakfast ready for tomorrow’s Breakfast Club. 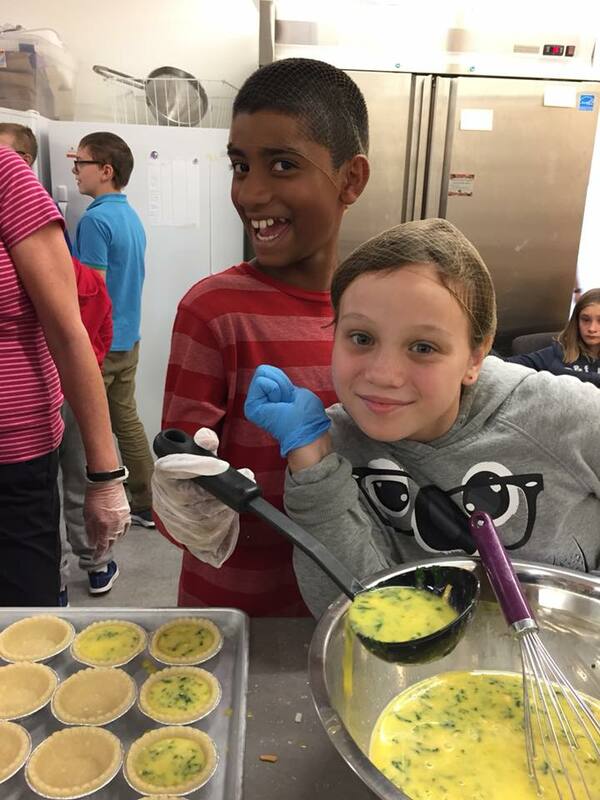 They have completely created the menu (quiche) , bought the groceries and have worked as a team to make their food. They are integrating their math learning into their cooking and have a great time!!!! 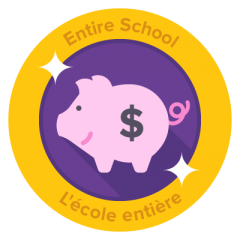 Our school focus for fundraising has moved away from door to door selling of food items, and we have focused on Bingo and Nevada as our main fundraisers for the school. This allows us to really role model what we are teaching every day with regards to Healthy Choices and does not require our families to be purchasing cookies, chocolates and pizza options. The positive results are families do not feel pressured to buy these food items and then having to eat them in their homes!!! ADDING VEGGIES AND SMOOTHIE OPTIONS TO PASTA DAY at school!!!!!!!!!!!!!!!!! 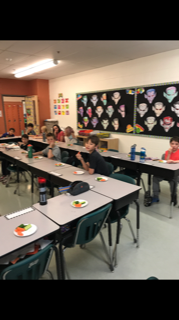 Our heroes today are the Grade 4’s who are modeling healthy eating to their classmates and adding a healthy side option!!! Our school invited a local farmer in to speak with the students about healthy grains and where they come from. He spoke how eating well could help decrease the risk of many possible future ailments. 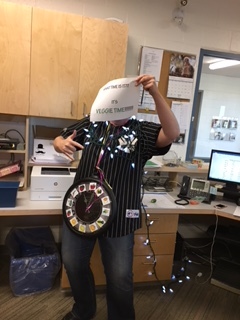 Our hero is Mr. T who volunteered his time to teach our students and staff about the food we eat!! HEALTHY FOOD RAPS IN THE MORNING!!! Our VP started this initiative when she rapped on the announcements about Healthy Food and all of the benefits of making great food choices! We have invited all students to create a rap, song, or poem to help spread the word!! 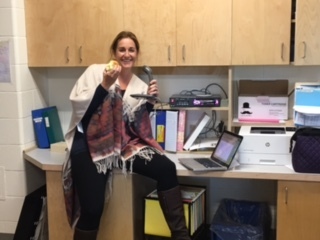 Our Hero in this case was our VP, Ms. Lafrance, who rapped for 2 minutes on the announcements in front of a lobby full of parents and 600 students!!! WAY TO GO MS. L!!!!!!!!!!!!!!!!!!!!!!!! 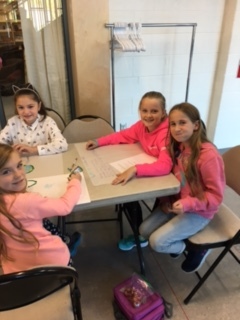 Our Eco Club is busy making posters for the school wide litterless lunch day they are planning! The Heroes are these wonderful students who have given up their recesses to make our school and world a better place to live!! We have a school garden in our playground that we started in the Spring. The students planted tomatoes and took turns caring and watering them throughout the summer months. A very special EA in our school helped care for them as well this summer and we were able to enjoy them when we returned to school. 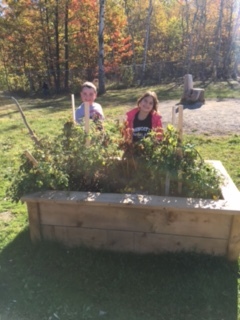 The positive results were the students were able to plan the making of the wooden garden units, pick plants that would thrive over the season, and they were recognized by our School Board for their hard work! Water consumption is a focus this year for daily drinking as well as when we attend sporting events. 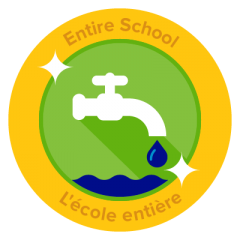 We have a water station on the second floor of our school that counts how many water bottles we have filled and we are trying to beat our record every month to boost water consumption in general as the healthy alternative. The positives are that the staff are modeling this behavior as well and it is benefitting all of us!!! 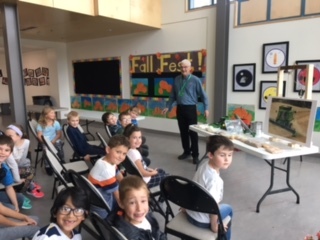 We are currently in the middle of our Fall Feast where we have community organizations come into the school to teach us about local farmers, dairy farmers, healthy eating options. 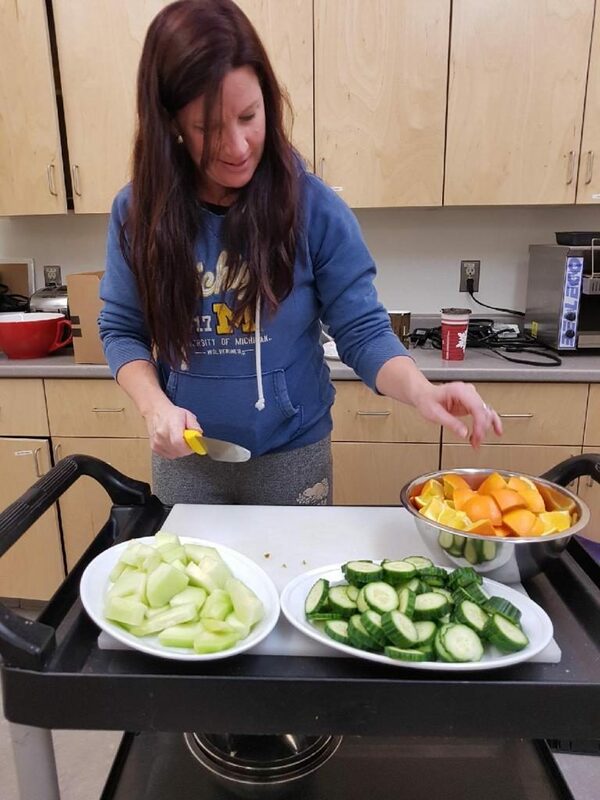 At the end of our Fall Fest, we have a Fall Feast for the school and introduce all the healthy options we have been introduced to over the last week and we also invite families to bring in healthy food to share with the school as well. Fall Fest in the month of October introducing local farmers, healthy eating ideas and teaching about what our own community has to offer :)))) We finish this education week with a Fall Feast where we showcase all these food ideas and invite the community and family to come and join us. 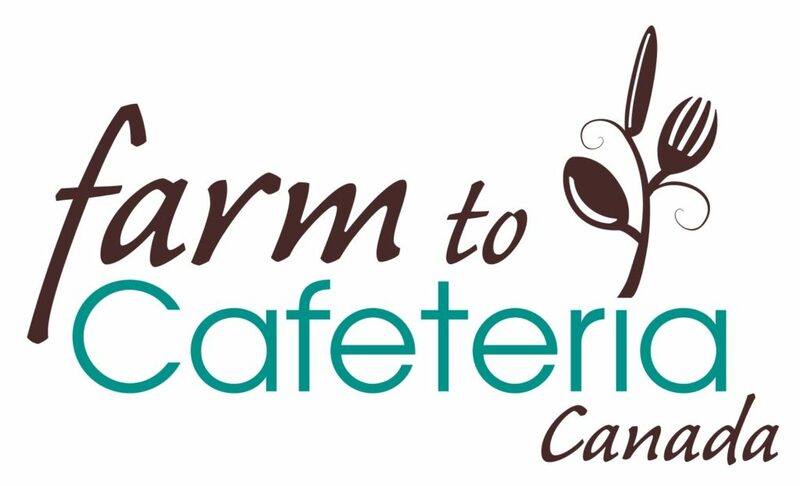 We have polled our students and families for their interest and/or need in the program and food ideas. 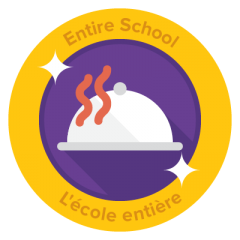 We have created a menu with the students so they are excited to start their mornings with the food they want and we know they will happily eat and fuel their brains! The positive results are that the food options are so amazing that some of our attendance concerns have corrected themselves because these students do not want to miss breakfast and are ready for the day now! The heroes in this building are our amazing Educational Assistants who work so hard to make healthy, delicious breakfasts each morning that are serving more than 100 students each day! 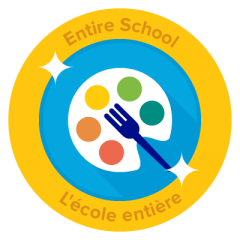 Painting your Plate allowed the students to see how colourful your plate should look if you are eating a balanced meal. 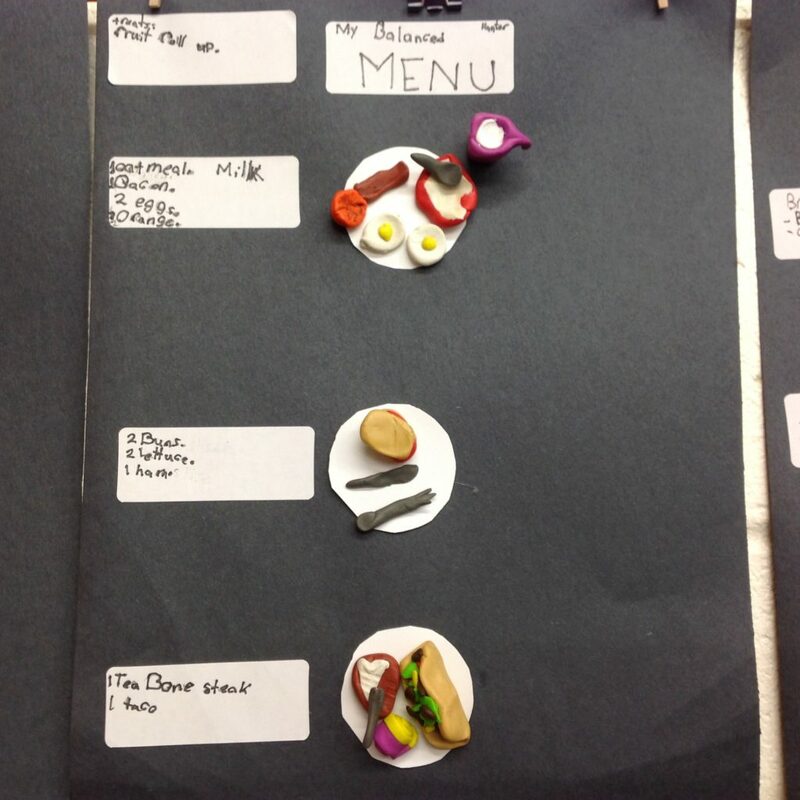 It also allowed us to see a picture of what portion size should look like as well. The varieties of food choices was also a conversation that was brought up with the help of this program. It allowed us to link it to the Northern Fruits and Vegetable program as well. so the students could see the link between the two. 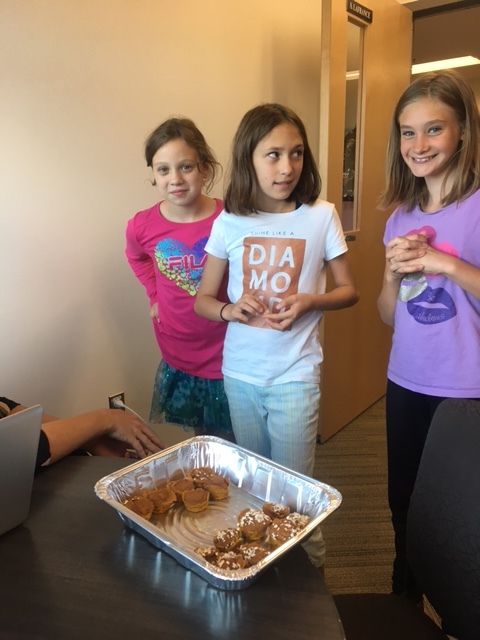 Students prepared Pumpkin Spice muffins for the school today! With only 3 ingredients! The recipe was healthy and easy to make at home for all of our families to celebrate Thanksgiving! The heroes were our wonderful students who shared their joy of cooking with the school!